Goldfish are one of the most popular fish in the aquarium, especially for beginners. The Shubunkin Goldfish looks like the Comet Goldfish but brings an element of extra color and flair to the tank with its longer more flowing fins and blue coloring. Their pretty appearance means it can be used to brighten up any fish tank or pond. These fish are also very hardy, and are known to be extremely adaptable and able to survive in most situations with a wide variety of food. What Size Aquarium Do Shubunkin Goldfish Need? How Many Shubunkin Goldfish Can Be Kept Per Gallon? 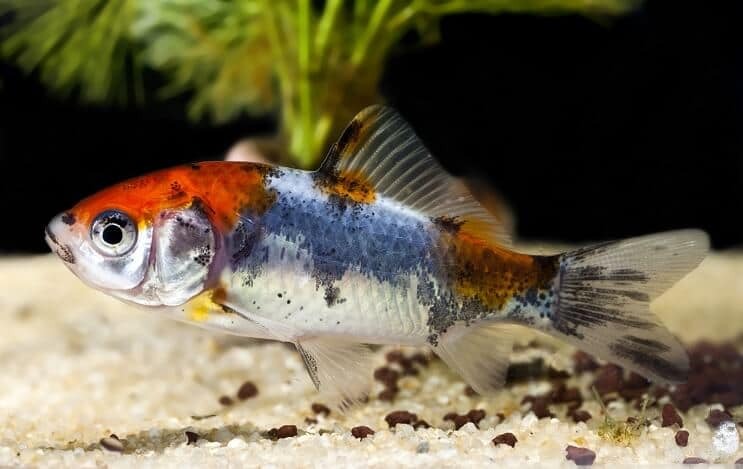 The Shubunkin Goldfish has become popular because of it’s coloration. They belong to the Cyprinidae family, just like Carp and Danios. The have several shared characteristics including not having true teeth but a few rows of pharyngeal teeth, located in the throat. The coloration, calico, is also the reason these fish go by the common name Calico Goldfish; however, their scientific name is Carassius auratus. Calico refers to a multicolored or mottled animal. You may have heard the term ‘calico cat’ and it is much the same. Like many Goldfish, they make amazing additions to indoor aquariums and outdoor ponds. They are at home in colder waters which means they are ideal for ponds. Their colors can even resemble the more expensive Koi which makes them ideal to create a stunning pond on a budget. If you are looking to get the most out of your fish, then making sure they have enough room to grow will allow them to live for many years to come. Therefore, having a pond is the best habitat as it will give them space to grow, however it is not mandatory. You can also keep these fish inside if the tank is very large with plenty of room (more on this later). These fish are extremely social and will make amazing additions to community tanks full of other fast swimming fish. The reason for this is that these Goldfish are extremely fast swimmers and will eat as much food, as fast as possible. You will likely see them around the bottom of the tank eating whatever they can, making the addition of other scavengers unnecessary. These fish come in many different patterns, all with the Calico coloration. When you hear the word “Calico” you probably think of the cat. The reason for the color is all to do with genetics. 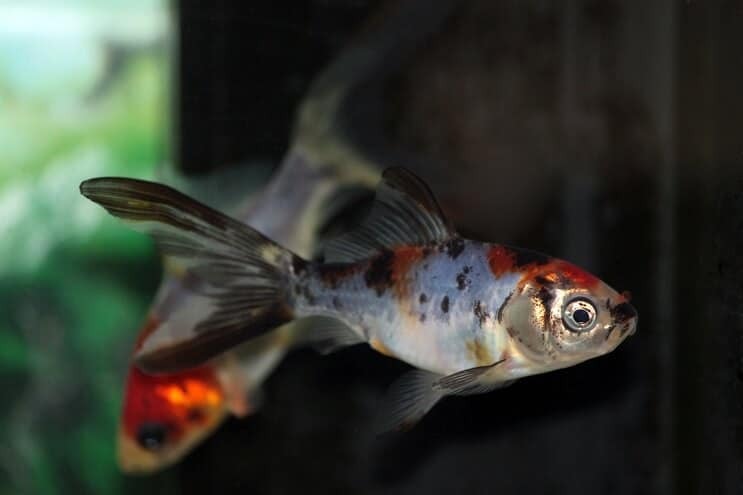 Shubunkin Goldfish have a spotted color, which is usually a combination of red, yellow, orange, white, black and blue. They also have long flowing fins that add to their appearance. As they swim you will see these fins flow with their movements and look beautiful. The most unique characteristic is the blue coloration that some Calico Goldfish can have. This blue is incredibly rare and helps to determine the price of these fish. The bluer a fish, the rarer and more expensive it is. The London Goldfish will have a varying coloration (but still with the calico pattern). The fins will be more rounded and the body more slender. The Bristol Goldfish has more of a slender body, like a Comet, but has a distinctive tail. They also have larger, more pointed tail fins. Finally, the American Goldfish is also distinguished by the tail. They will have a longer pointed tail with a much deeper fork. It is believed that this type, also referred to as the Japanese Shubunkin, is the original variant instead of a different type. The Goldfish you see in stores today are descendants of wild carp from Asia. As a member of the Cyprinidae family, they prefer to live in slow moving, lakes, rivers, ponds or ditches. Here they feed on plant material, detritus, small crustaceans and insects. These wild carp were not as colorful and today’s Goldfish have been bred to bring out the different patterns and bright colors. This breeding has not lost the nature of the fish though; their behaviour and dietary needs are very similar. They can live up to 30 years and grow to over 12 inches. Conditions must be near perfect for this to happen; meaning lots of food and space. In an aquarium setting, your fish are likely to live for around 15 years if you keep their tank or pond conditions good. The size of your fish will depend on the space they have and how much food they consume. In order to keep your Goldfish healthy, make sure you have a tank with plenty of room for them to move and search for food. There should be low to moderate water movement and a good amount of light. Keep the water itself as stable as possible to avoid stressing your fish; however Goldfish are hardy and will tolerate change better than other fish. For substrate, most will work for these fish. Medium size gravel is best as it allows them to sift through the gravel and find bits of leftover food and other materials. Having a good filtration system is important as these fish are incredibly messy. Frequent water changes are also important to keep the water clean and the fish healthy. Plants can be hard to keep with Goldfish as they may be eaten. Even the ones they do not eat may be uprooted in their constant search for food. If you do want to keep plants, consider fast growing species such as Java Fern, Anacharis and Hornwort. 75 gallons is the minimum size needed for Shubunkin Goldfish. Because these fish are such fast growers, the bigger the tank the better. Make sure to not overcrowd your tank by only having 1-2 fish per 75 gallons. The first thing to know about tank mates is that these fish are very active and will steal food from other fish. This means that slow moving or shy fish will not make the best tank mates. Tetras, Guppies, Killifish, Glass Catfish and Cherry Barbs all can work alongside the Shubunkin Goldfish. Because they are so active and fast moving while feeding, you may have to watch and feed your fish at different times and in different areas to allow for each fish to eat properly. Do this by feeding your Shubunkin first on one side of the tank, then switch to the other side to let your slower fish enjoy their food. While it is possible to add more shy and peaceful fish, it adds a level of complexity that some people may not yet be ready for. If this is the case for you, add other species of Goldfish or Koi to your tank. 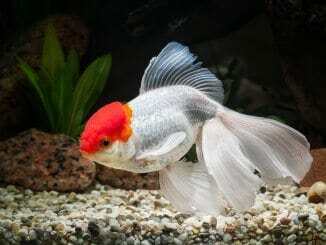 Fancy Goldfish, Comet Goldfish and Koi will all have the same attitude and temperament. They also have the same general colors with lots of variation which makes them look great together. If you are thinking of adding any Crustaceans or other invertebrates, then you are in luck. Pick larger, peaceful invertebrates such as Amano Shrimp or Mystery Snails. Avoid smaller creatures like Cherry Shrimp and Ghost Shrimp who may be mistaken for food and eaten. Make sure to avoid overly aggressive fish such as Cichlids or Tiger Barbs as they will attack and eat your fish. It can be hard to say what these fish ate in the wild due to them being a captive created and raised species. However if we take a look at their carp ancestry, it is likely that they ate whatever they could: plant material, small insects or scraps of detritus. Goldfish feed on plant material, detritus, small crustaceans and insects. They actively search the bottom and middle of the water column for anything they can fit in their mouth. The best part about this behavior is the fact that you will not need to have scavengers in your tank. Your Shubunkin Goldfish will do most of the cleaning for you. The bad part is that Goldfish may uproot or eat plants in search of food. This is the reason that certain plants like lilies or fast growing species go well with Goldfish. Because of their nature, you can get away with feeding them a wide variety of food. Most people use pellets which will give them the nutrients that they need. Use pellets or flakes as their daily staple food and feed them as much as they can eat within two minutes, twice a day. They are omnivorous so will enjoy a combination of both plant based foods and meaty foods. As a treat once or twice a week you can give them vegetables from your kitchen such as cucumber or blanched greens. 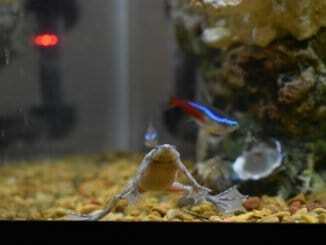 You can also feed them live or frozen foods such as bring shrimp, daphnia, blood worms and tubifex worms. Like any Goldfish, Shubunkin are extremely messy. This means that you will have to perform water changes and clean your tank more often that other species of fish. This is not too much of a problem, but can be time consuming. You must do everything you can to keep your tank clean to avoid parasites and bacteria, perform a 25% water change every one to two weeks. 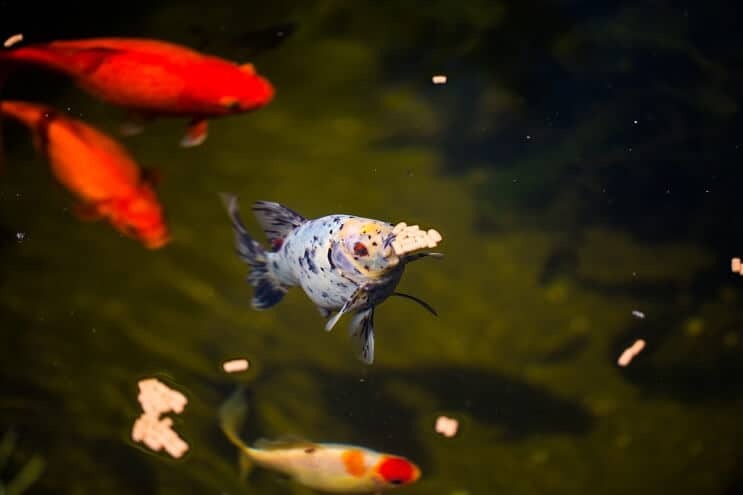 Along with the other main fish diseases, keep a close eye on your fish’s skin for a specific disease called Goldfish Ich; this is the most common Goldfish disease in aquariums. Ich is a parasite that shows itself in white spots on the surface of your fish. The first sign of this parasite is your fish ‘scratching’ itself on its surroundings. If left untreated, the white wounds can lead to bacterial and fungal infections. 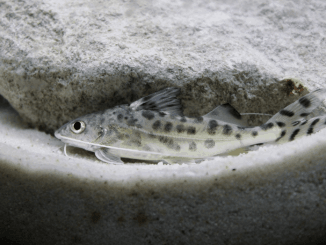 Your fish will become lethargic and eventually die. The good thing is, this is treatable. There are several products available to add to your tank that will help get rid of the parasite. Isolating sick fish is always important so sickness and disease doesn’t spread. You should also watch out for is swim bladder disease. If you see your fish swimming sideways, floating, or it is bloated then a buoyancy problem may be the case. Another big problem with these fish, especially with their large fins, is fin rot; a bacterial disease caused by poor water conditions. Keeping the tank clean, and your fish happy and calm, is the most effective way to prevent any disease. When fish are stressed they can become susceptible to illness. There are plenty of commercial treatments for these diseases, but the best medicine is prevention. Most, if not all, illnesses can be prevented through proper water control and weekly monitoring of the water parameters. Shubunkin Goldfish were likely first bred in Japan from Carp and are now one of the 125 Goldfish species traded worldwide. They will breed in groups of at least 4 or 5. They are very sociable animals and prefer to shoal in larger groups. Shubunkin will spawn in the right conditions which means if you make sure the tank conditions are perfect, the fish will breed without any other intervention. To start the breeding you first need to have a separate tank setup; also called a breeding tank. This tank should be full of plant life to help with the spawning and to catch the eggs. Artificial plants will also work just fine. In order to get your fish to spawn, slowly drop the water temperature to around 60°F. Then begin to warm the water by 2-3°F per day until you reach around 72°F. Goldfish breed in warmer waters so this should stimulate them to be ready to spawn. Feed them lots of high protein foods like brine shrimp or bloodworms. Ensure that there is not too much left-over food as it will sit at the bottom of the tank and make the conditions harsh on the fish. Males may start to chase the females, non-aggressively, for a few days and their colors will begin to darken and intensify. The males will then push the females against the plants which causes the females to release eggs for the males to fertilize. Spawning can last a few hours and produce up to 10,000 eggs. Once spawning is done the parents will begin to eat any eggs that they can find. For this reason, the adults must be removed. It will take around 7 days for the eggs to hatch. Feed the fry small food until they are large enough to eat brine shrimp or other larger food. Once they reach about once inch they can be added into the adult tank. Shubunkin Goldfish make excellent fish for both beginners and advanced aquarists. They can fit into many community tanks as well as outdoor ponds. There are plenty of fish that will work well with them and keeping this fish will provide you with an energetic and active species. No matter your level, you can find a benefit to these colorful and hardy fish. There is little to watch out for except for keeping the water conditions stable. 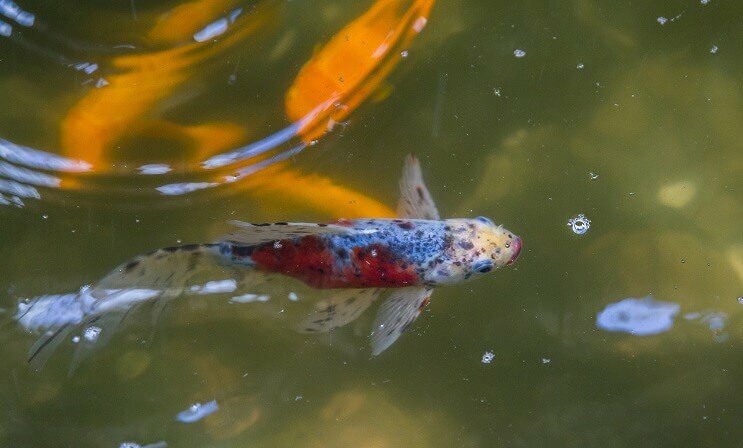 They add so much to your tank and can even be additions to ponds as an alternative to Koi. If you have a large enough tank or pond for these fish, then they could be the fish for you.